The Jewish civilization is one of the oldest on earth. It has been in existence for about 4000 years and certainly it shall continue to have a place on the world scene. It is not defined by the kingdom of David or by the state of Israel, but by the ability of the Jews to live among non-Jews and yet maintain a separate identity. In what does this identity consist? This question interests not only Jews, but also all who interact with them on various levels. The better we know each other the easier it will be to avoid misunderstandings. Feliks Koneczny (1862-1949) studied civilizations analysing their underlying ethical and also religious, legal and sociological components. Arnold Toynbee characterised him as a scholar who "approached his generalisations from the four standpoints of a student of East European and Central Asian history, a Pole, a Roman Catholic Christian and a Westerner." 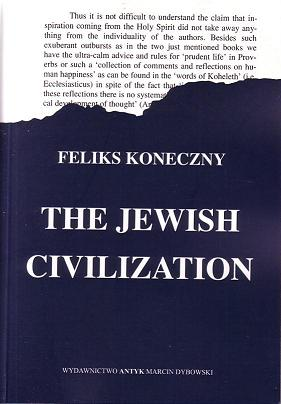 Koneczny viewed the Jewish civilization from the outside, as a critic, but also admiring its versatility, durability and consistency. 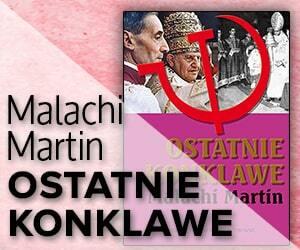 Koneczny finished writing this book in 1943. At that time the largest portion of the world's Jewish population lived in Poland. Most of them followed a distinctive lifestyle setting them apart from the Polish population. They worshipped differently, dressed differently, spoke a different language, and lived in separate sectors of the towns. They appeared to be very different from the integrated Jews of the West. And yet Koneczny deciphered the nature of the bond tying them with the rest of the world's Jews. 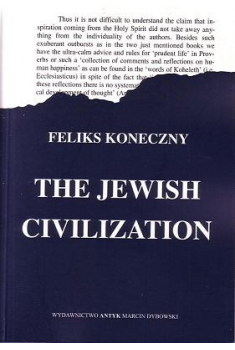 Koneczny knew nothing about the holocaust which was about to happen, and the state of Israel was something of the future. His conclusions however still remain pertinent in the present globalized world.